St Saviours Church was originally designed by Belgrave Square architect George Basevi in 1838. 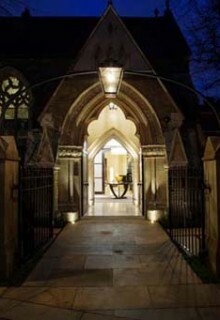 It is now a Grade II Listed Building and is located in a Conservation Area in Knightsbridge. Part of the church was sold and converted into a 4 storey dwelling. We worked on the planning stages of the refurbishment of the dwelling, which included extending and refurbishing the subterranean basement. The Local Authority required that the development be assessed under EcoHomes and achieve a ‘Very Good’ rating. Due to the complexity of the building, we worked closely with the client and design team to advise on how best to achieve the required environmental standards without damaging the building’s character, as well as maintaining many of its original features. We provided guidance throughout the design and construction process to ensure that the EcoHomes requirements were met, and a high quality, energy-efficient and sustainable dwelling was created.